I've been in a yeast-dough making mood lately and one of the most rewarding yeast-doughs to make has to be cinnamon rolls! It's hard to believe but we hardly ever ate them until I made my first batch about 3 years ago. Since then, it's become a family favorite. My husband requests it all the time and I'm happy to oblige when I have the time. A fresh batch of cinnamon rolls straight from the oven on a weekend morning is one of the ultimate treats, and we should treat ourselves! For the last 3 years, I've been making the small-batch recipe I originally adapted from Oh Ladycake's vegan version. They produce the softest, most squishy, delicate little cinnamon rolls! I've taken that base dough recipe and made versions from peanut butter to Nutella, chestnut cream to almond paste (mainly with chocolate thrown in). They're all heavenly but there's just been one problem...the recipe makes 4 small rolls and each time we have them, they seem to vanish more and more quickly, and we sit there wishing I'd doubled the recipe somehow. Sometimes, you're just not in the mood for portion control! So I toyed with the idea of making a larger batch - finding a recipe that would make slightly bigger, heartier rolls but would still be soft and pillowy like the small-batch version. I've been reluctant to mess with a great thing but I finally tried it. So now we have my cinnamon rolls, version 2.0! It makes 9, more-substantially sized, cinnamon rolls that are soft and tender. I think the key is nailing down the dough itself. Once you have that, you can customize the filling beyond the basic cinnamon-sugar combination. So I went back to Oh Ladycakes and found her coconut oil cinnamon rolls, which appeared to be the larger batch version I was looking for. Again, I "de-veganized" it. With no disrespect to coconut oil lovers, I swapped over to butter as well as regular milk over the coconut oil and almond milk in the original recipe. And the dough...well, it has a far heftier amount of yeast and the proportions make for taller, sturdier individual rolls. Not over doing it with the flour, the rolls are soft and tender, with a nice chew. They are slightly less fragile and squishy than the small-batch version but quite comparable. I was very happy with the process of making them and the result. It was so good to see all these gloriously puffed up cinnamon rolls come out of the oven and stand tall on their plates! Playing around with this inaugural batch of my cinnamon rolls, 2.0, I realized I was a little too stingy with the filling. More on that later...but I filled them with a mix of granulated and brown sugar, finely chopped chocolate, and cinnamon. My family and I love a little chocolate in our cinnamon roll filling! It was delicious and would be even better with just a bit more of the good stuff inside. We made up for it with a generous coating of vanilla glaze. Next time, I'll correct the filling situation and have fun with our other favorite fillings. 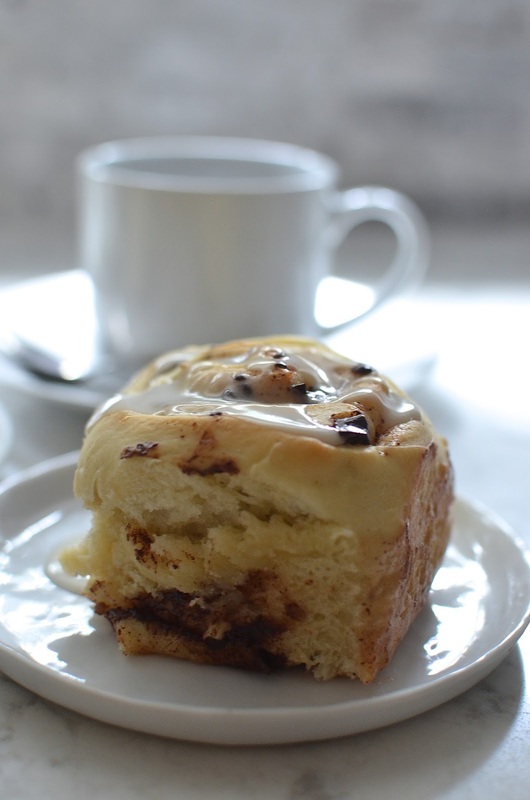 There's always an excuse to make another batch of cinnamon rolls! Let's start with the all-important dough. It was a change starting with a more substantial amount of yeast and working with a larger portion of dough but it was also a very familiar process. As I mentioned, I made a few adjustments to the recipe. I used butter instead of coconut oil and since I was using regular whole milk instead of unsweetened almond milk, I also reduced the sugar in the dough slightly. It's fun to do what you want in your own kitchen! The dough will be quite sticky so I flour the board and my hands just enough so that I can work with it. The amount of flour is intended to make for soft rolls, which is exactly what I want! If you prefer sturdier rolls and don't mind a bit more density to them, I'm told you can easily add an additional 1/4 cup of flour to the recipe. After the dough comes together, and you've kneaded it to a smooth mound, it goes for its first rest and rise for about 1-2 hours. After that time, it will have essentially doubled. Give the dough ball a light punch and then remove it to a clean floured surface to knead for a minute or two to work out the air bubbles. As I mentioned, I was a little stingy in this first go-round. What you see here: I started with 2 tablespoons of melted butter, then just 1/3 cup of sugar (a combination of both granulated and brown sugar), and 3 ounces of chopped dark chocolate. We tend to go light on the cinnamon so I used about 1 teaspoon but you can take it up to as much as a tablespoon if you like. What I would do next time: I'd stick with 2 tablespoons of butter but use 1/2 cup of sugar and 4 ounces of chocolate. My husband wanted more chocolate and I think an extra ounce wouldn't hurt. I feel like I can go a little lighter (relatively-speaking since we're talking about cinnamon rolls) on the sugar because I'm adding chocolate. If you do not use chocolate and simply go with a cinnamon-sugar combo, I would recommend using even more, maybe 3/4 cup or so. Once rolled into a long log, I sliced it into nine rolls and nestled them into a square baking pan. The recipe called for a 9-inch pan but it worked fine in my 8-inch. I also want to note I lined the bottom of the pan with a piece of parchment and only came to realize that instructions were for lining the entire pan with parchment (so you can more easily remove all the rolls together after baking). I always prep my cinnamon rolls the day before and finish them off in the morning. To do that, I cover the rolls at this point and keep it in the refrigerator overnight. The next morning, I take them out to proof one more time for about an hour or so before baking. As you can see below, the rolls have already puffed and filled in much of the empty space between them. Into the oven for about 25 minutes or so and we have tall, glorious, fresh cinnamon rolls for breakfast. All they need is a glaze and I made a simple vanilla one this time to go on top. We prefer a bit more of a thinner glaze over a thick icing. These rolls are the taller, sturdier versions of the small batch version. While the smaller ones are almost difficult to hold up because they are that soft and tender, these are more like "company" rolls - more substantial ones great for a crowd. I like them both; maybe my husband has a slight preference for the baby soft ones but no matter how we slice it, these rolls were a winner. I loved making them and it was a joy to taste them. I am definitely looking forward to making my next batch of cinnamon rolls no matter which recipe I use! Hope your summer is "rolling" along nicely! I enjoy approaching each day with a clear head and seeing where it takes us. Time is flying so I just want to live in the moment, enjoy my treats, and take it all in stride with my family. Hope you savoring your days, however you like to do that best. Make dough: Place water in a measuring cup and add the yeast. Gently stir to combine and add a pinch of sugar. Let sit until mixture turns foamy, about 15-20 minutes. Place butter into a small bowl and whisk in the sugar and the milk. In a large mixing bowl, whisk the flour and salt together. Make a well in the center of the bowl and add both the yeast and milk mixtures. Using a rubber spatula, gently stir the ingredients together until the flour is completely absorbed. Turn the dough onto a clean, lightly floured surface (I like to do it over parchment paper) and knead for 4-5 minutes. The dough will be quite sticky; flour the surface, as needed. The kneaded dough should be smooth and still slightly sticky. Transfer it to a lightly oiled bowl, cover with a towel and place in a warm spot for 1-2 hours, until doubled. Line a 9-inch square baking pan (an 8-inch pan will work as well) with parchment paper and lightly oil it; set aside. Fill and shape rolls: Combine filling by mixing the granulated and brown sugars together in a bowl with the cinnamon. Line your countertop with a large piece of parchment paper and lightly dust it with flour. Lightly punch down the dough and remove it from the bowl. Set it on top of your work surface and knead it for 1-2 minutes to work out the air bubbles. Let rest for 15-20 minutes (this will make the dough easier to roll out). Roll the dough out into a 12x18 inch rectangle. Spread the melted butter over the dough, leaving about a 1/4 inch border. Sprinkle it evenly with the cinnamon-sugar. Sprinkle the chopped chocolate on top of that. Then, staring with the long end, roll the dough into a log. Slice the log into 9 rolls and place them into the prepared pan. Do-ahead: At this point, cover the pan with plastic wrap and refrigerate overnight to bake fresh for breakfast tomorrow. Bake and glaze: In the morning or when ready to bake, remove the pan from the refrigerator and place the rolls in a warm spot for about 1 hour. Preheat oven to 350 degrees. Bake for 25-28 minutes, or until golden. (A tester inserted into the cinnamon rolls should not have any sticky dough attached to it). Remove pan from the oven and let sit a few minutes, then remove the rolls from the pan using the parchment paper and set it on a wire rack. While the rolls are cooling, make the glaze by whisking milk and vanilla into the confectioners' sugar. Start with 1 1/2 tablespoons milk and add more to reach the consistency you like. Top warm cinnamon rolls with glaze and serve immediately. Enjoy every bite! This reminds me that I haven't had a cinnamon roll in ages! Need to bake some soon. These look so soft and irresistible, Monica. Great treat once in a while but it can be a bit habit-forming, as I'm learning. Just like Angie, it reminds me that I really haven't had or made cinnamon rolls from a while. They look fluffy, soft and absolutely delicious! Monica you should check your email settings I don't get your posts in my inbox as soon as you post. I saw this post in the morning so I knew you posted but haven't got it in my mailbox yet. Thank you for that...but I'm embarrassed to tell you how little I know about all the technical stuff. The feedburner I use only distributes posts to inboxes at certain times and it's set at every morning so that's why you don't get them real time. It's archaic here, I'm afraid. Oh my goodness, these look so soft and fluffy, Monica! Perfect for a nice and relaxing weekend breakfast and enough to impress company :) I can just imagine how amazing your house smelled while these were baking up. So delicious! It came to my account today at 4:52 AM. I unfollow you and follow again and see if it asks me the option when to deliver the post. Sorry for all the extra work for you, Bal. It should get distributed automatically some time between 6-7am Eastern time. I've been on a yeasted bread kick as well lately! But no cinnamon rolls - I must fix that! They have long been a favorite of mine and these look fantastic! I wish I had one to go with my coffee right now! Oh, I can imagine all the good hearty breads coming out of your oven, Ashley. Hope your kitchen is all done! Cinnamon rolls are something I've never made. I always find them somewhat intimidating.... I need to do it - they are so good and worth it! You just reminded me that I have not made cinnamon rolls for age...yours look great Monica, I love the idea of chunks of chocolate in it...I will have to give this a try next time. I'm trying to spread the cinnamon roll love here, I guess! : ) Hope you're enjoying the summer. My goodness these look perfect! Your buns look so light and fluffy - a must try at my house! I want to eat everything you make Monica. You're an amazing baker :) Hope you're having a wonderful summer. You are way too kind! Summer is super busy and nice in a whole different way from the cooler seasons. Both good but summer is surrounded by ice cream so it does have that edge. ; ) Hope you are well! I hope you make them...but just a warning, there's no turning back!! I love cinnamon rolls, but I don't know why I don't bake them often. These rolls with chocolate looks so intriguing, Monica. I love chocolates, so I can't wait to try this one.